The first MiG-15 arrive at Cuba at the end of May of 1961, a month after Bay of Pigs. They were 20 MiG-15bis and 4 MiG-15UTI. With these equipment are formed the first two MiG-15bis Squadrons. Cuban Missile Crisis. Hunting the CIA ship Rex. The first MiG-17AS arrive at Cuba at the beginning of 1964, destined to Santa Clara. Its main mission was to fight as fighter-bombers. The MiG-17AS were a rare version with air-air missiles. In foreign campaign. Angola, Ethiopie, others countries. By the Missile Crisis in October of 1962, were in service 11 MiG-19P. This aircraft converts the FAR in the first Latin American Air Force with supersonics fighters. At the same time they are the first soviet interceptor with all weather capacity, thanks to its radar. In total from 1962 to 1989 to Cuba arrives some 270 MiG-21 fighters in 9 versions, being the main combat aircraft of the country during the Cold War. Fight the enemy ships. Participation in Angolan and Etiophie Wars. Collaboration with Chile, Perú. The Cuban MiG-21 'attack' the Dominican Republic. An incident with a Cuban ship retained by the Dominican Republic in 1977, almost carries to a conflict between the two countries, resolved after the demonstration of power of various MiG-21 of the Cuban FAR over the neighboring country. Somalia never recovered from the defeat in the war of the Ogaden in 1977-1978 at the hands of Ethiopian and Cuban armies. The decisive participation of the MiG-17 and MiG-21 Cuban in this conflict. This was the most important fighter of the USSR in the 70-80s, with their variable-geometry configuration and nuclear capacity. The appear in the FAR of these airplanes, considerably growed its attack capacity, which trembles the political circles in USA. 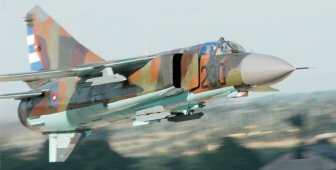 The Cuban MiG-23 Crisis. Air support missions in the Angolan War, against the South African Army and the UNITA guerrillas. The Cuito Cuanavale victory, Attack of Calueque, others actions. Without being an industrialized country, Cuba has made a modest effort in the field of the national aeronautical engineering, reflected today in this article. List of airplanes that were in service in Cuba. The first international flight of Latin America, and world record of distance, made in 1913 over the sea by two Cuban aviation pioneers, in the epoch of the fragile airplanes and audacious feats. The Cuban Air Force and the Revolution of 1933 (1933-1938). The Revolution explodes - Organization changes of the Aviation Corp - Some aviation actions in 1933-1934 - The quiet years 30 - Purchases of airplanes in 1933-1939 - Important Flights of the Air Corp in 1936-1939 - The "Cuban Eight"
The Trasatlantic Flight of Menéndez Peláez (1936). The Cuban military aviator Menéndez Peláez, becomes in 1936 the first Hispanic that crossing the Atlantic Ocean from America to Europe, opening new air routes that later would be exploited with success. Pan-American Flight "For the Columbus Lighthouse" (1937). In 1937 the Cuban and Dominican aviators made this famous flight of good will by various countries of the continent, that finishes tragically, perishing Men�ndez Pel�ez and six of their companions. In 1938 and 1940 the Aviation of the Cuban Army and the Cuban Navy repeat the feat. The Cuban Air Force and the Second World War (1939-1945). The Cuban Army Air Force (FAEC) and Batista (1952-1955). The Cuban Army Air Force during the Revolution. The Cienfuegos Revolt (1956-1958). The Cuban Army Air Force against the Fidel's guerrilla (1956-1958). The Cuban Army Air Force: last operations against the guerrilla (1958). The Rebeld Air Force, the guerrilla aviation (1958). The Rebeld Air Force operations against Batista (1958). With the recent declassification of a whole bunch of CIA papers dealing with the Bay of Pigs invasion, some obscure subjects are seeing the light of day. In this article the author takes us on a guided tour inside of a CIA secret airbase in Guatemala, known as JMMadd. This article deals with the operational history of the Cuban Air Force's Hawker Sea Fury Squadron, including its participation during the Bay of Pigs incident. The Major Ernesto Che Guevara was a great aviation lover, and in Cuba he was graduated as pilot, flying more than 1,000 hours in different types of airplanes of tha Cuban Air Force. The Nobel Prize of Literature counts the beginnings of the Cuban military mission in Angola, the first secret flights of Cubans special troops to the African country in the legendaries Bristol Britannia, the cultural, political, and historic causes that move Cuba to the encounter of its African roots. By 1962 the intensity of the loops between Cuba and the Soviet Union required that be to opened a direct air route, that beginning the gigantic aircrafts Tu-114. Later in Cuba were based the aircrafts Tu-95 and Tu-142 Bear of the VVS and the VMF of the USSR, whiles flights around USA would be some of the symbols of the Cold War. In 1977 Ethiopia is invaded by Somalia, and asks helps military to Cuba. As part of the military contingent military, arrive Cubans pilots, that fight together the ethiopian until the victory of 1978. The September 27 of 1987 an air combat is produced in Angola between the Cuban MiG-23 and the South African Mirage F1, one of which was shoot down. Arthur Piercy, the South African pilot of this lost airplane, relate its own version of the event. Arthur Piercy, the South African pilot of the anterior article, count their Personal data and Flying Career.